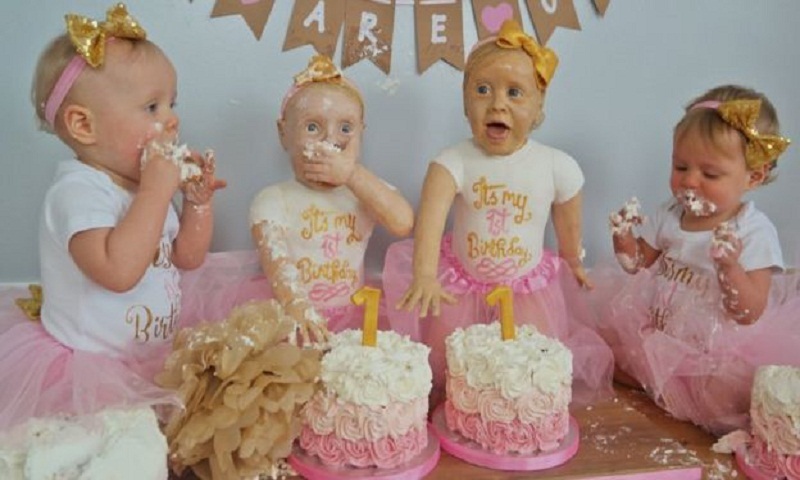 An amateur baker has created life-size cake versions of her twin daughters to celebrate their first birthday. Lara Mason, 31, from Walsall, spent more than 100 hours crafting the edible version of her daughters Lily and Lyla. The creation was made from 44 eggs, 2.2kg of flour and 4kg of buttercream. "It's the most critical I have ever been while making 'cake people' because I feel like I did such a good job making them so cute in the first place," Mrs Mason said. Mrs Mason's previous creations include a life-size Prince George cake and a recreation of Johnny Depp's Pirates of the Caribbean character, Captain Jack Sparrow. In a post on Facebook, Mrs Mason said the effort was "100% worth it" and joked she would be "cleaning buttercream out of the floorboards for months". She added: "What other kids get to say that their mum made them life-size cakes of themselves for their first birthday?" She added the hardest part was the hair, made out of pulled sugar, with each individual strand made separately, reports BBC.